State Sen. Bill Galvano, a Republican and incoming Senate president, says the Florida Senate is preparing a sweeping package of legislation in the aftermath of the deadly shooting at a high school. Nineteen-year-old Nikolas Cruz is facing 17 counts of murder in the Wednesday afternoon shooting. 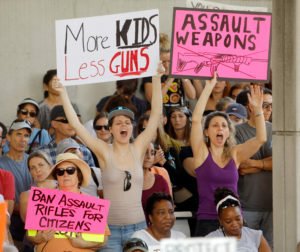 Left: Protesters hold signs calling for more gun controls at a rally Feb. 17, three days after the shooting at Marjory Stoneman Douglas High School, in Fort Lauderdale, Florida. REUTERS/Jonathan Drake.